New Delhi, 16th July. Delhi BJP workers led by the State President Sh. 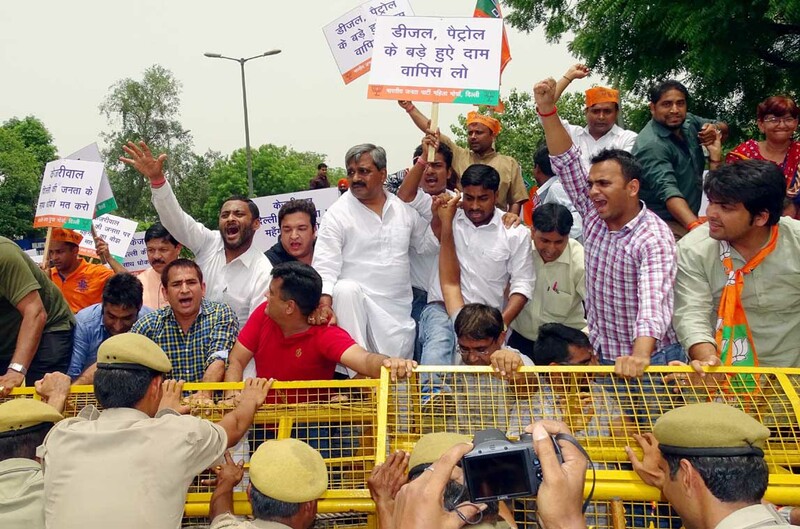 Satish Upadhyay today held a mammoth demonstration at ITO where they were stopped by police on way to Delhi Secretariat. They were protesting against the unwarranted hike in VAT by Kejriwal Government. The demonstrators included Pradesh Incharge Sh. Shyam Jaju, MPs Sh. Vijay Goel & Sh. Ramesh Bidhuri, MLAs Shri Om Prakash Sharma & Shri Jagdish Pradhan, National Secretary Sh. R.P. Singh, Delhi BJP Organisation General Secretary Sh. Siddharthan, State Office bearers Shri Ashish Sood, Smt. Rekha Gupta, Shri Tilak Raj Kataria, Smt. Shikha Rai, Sh. Jai Prakash, Sh. Kuljeet Chahal, Sh. Gajender Yadav, Morcha Presidents Smt. Kanwaljeet Sehrawat, Sh. Nakul Bhardwaj, Sh. D.P. Singh, Sh. Ramesh Balmiki, Spokespersons Sh. Rajiv Babar, Sh. Harish Khurana, Praveen Shankar, MCD Leaders Sh. Yogendra Chandolia, Smt. Meera Agrawal, Councilors, District & Mandal Office bearers. Municipal Councillor Smt. Sumitra Dahiya was grievously injured during the police action on the demonstrators. She was taken to Guru Nanak Eye Hospital from where she was referred to Rajendra Prasad Eye Institute of AIIMs. She is being operated for fixing artificial lance as she lost her sight. Addressing the demonstrators Sh. Satish Upadhyay said that no administrative excuse for hike being given by Delhi government stands ground. Delhi is a tax surplus state unlike neighbouring states and so there was no need to increase VAT rates. Even Sh. Arvind Kejriwal said this while speaking on the budget in the Vidhansabha. Secondly Sh. Upadhyay said a state government which is splashing public money on advertising its self proclaimed glories has no moral right to increase tax rates on the people. Sh. Upadhyay warned that such tax hikes damage trade of Delhi and result in revenue loss. The CM protests so much for rights why does he not protest against VAT hikes to save Delhi’s Distributive Trade Centre Status. Sh. Shyam Jaju congratulated BJP workers for the sensitiveness and taking to streets to protest against the anti people policies of Kejriwal government now getting exposed before the people. He said that there is great difference between the prophecy and practice of Sh. Kejriwal. He has become a U-Turn man. The decision to hike VAT on essential commodities like petrol and diesel shows that he is not concerned about the welfare of the people. Sh. Vijay Goel said people of Delhi now well understand the dirty games of Delhi government which has raised water tarriff by 10%, electricity by 6%, entertainment tax by 20% and now VAT by 5% affecting every household. Sh. Ramesh Bidhuri said Delhi government cannot any more fool the people. Every day he protests against our other BJP state governments but for Tax hike he humbly agreed as he has spent huge public money on his publicity. Sh. R.P. Singh said Kejriwal is taxing common people to fill the coffers of power discoms and fool the people through subsidies. Yuva Morcha President Shri Nakul Bhardwaj, Mahila Morcha President Smt. Kamaljeet Sehrawat, Poorvanchal Morcha President Shri Dinesh Pratap Singh and SC Morcha President Shri Ramesh Balmiki also addressed the demonstrators.